Convert from Roman numerals to Arabic numbers (1 - 3 999 999) and vice versa. 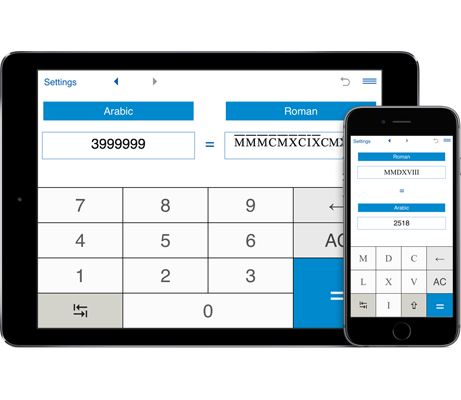 This free online advanced roman numerals converter performs conversion between Arabic numbers (from 1 to 3 999 999) and Roman numerals. Just enter either a whole number from 1 to 3,999,999 or a Roman numeral and click '='. A horizontal bar placed above a Roman numeral indicates multiplication by 1000. The application validates the input of Roman numerals.